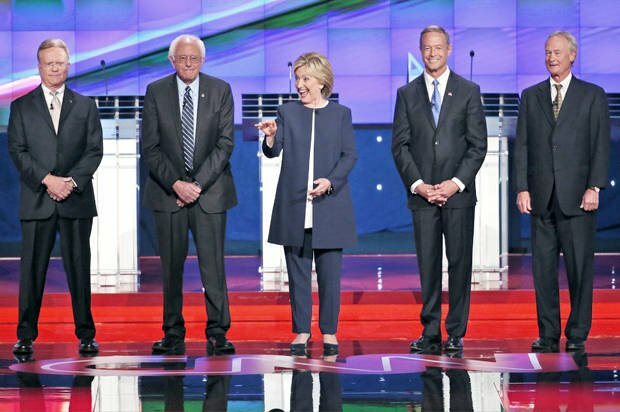 About the Democratic debate last night on CNN: Is this it? Is this the best the Democratic side of America can offer? I have to admit, by not screwing up, Hillary did well. She clung to her talking points tenaciously, brushed off any scandals (aided by CNN’s Anderson Cooper lobbing her softballs on the tough issues, and of course, Bernie absolving her of any email problems, the FBI investigation be damned), invoked her dead blue collar mom several times to the point where we were looking for the ghost to appear on stage, and absent a weird and untrue story about her and Barack chasing down some Chinese fellas to yell at them about climate change, told no apparent whoppers. She even made a funny about how long it takes us ladies to pee pee between commercials. She did muff on Wall Street, claiming oddly she “represented Wall Street” as Senator. That line will live on in a thousand Republican attack videos. In that same little speechlet, Hillary also mentioned in 2007 she went down to Wall Street and told them to “cut it out,” in relation to the massive financial crisis dumped on American a year later. Her statements about how well Libya worked out, and how she personally took down bin Laden with a rusty switchblade, were utterly false, but whatever, she’s said all that before. She did not shapeshift into her lizard form, and thus was the debate’s big winner. Bernie played to his loyal base and left the vast pool of others disappointed. At times he sounded like your drunk old hippy uncle, ranting about revolution. His most salient points, about climate change and the one percent, were often shouted. One could imagine the spittle that some poor stagehand had to swipe off the lectern afterwards. It is very unclear how many voters Bernie persuaded to switch over to him. He instead cemented his place in history as an “issue” candidate, one who runs to push some ideas further into the mainstream with no hope of actually winning. Bernie’s ideas are good. But he needed to show enthusiasm, righteous anger, and instead we just got a lot of bitching. See ya, Bernie, you have achieved footnote-in-the-history-books status for all time. The others really should have just stayed home. They were the equivalent of the Star Trek red shirts, background actors filling out scenes, handy to have around when a scriptwriter needs to kill someone off. 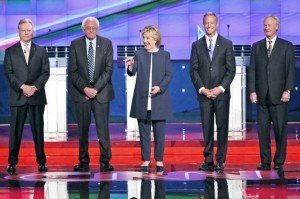 Martin O’Malley was running for something, maybe Hillary’s foot massager come 2016, but stumbled to make any real points. He sounded desperate about his turn as Baltimore’s mayor, saying things were actually pretty good then. Come on Martin, we’ve all seen The Wire. Lincoln Chafee — brother, it is over, if it had ever begun. When you explained you flubbed an early vote in Congress because you were new and your dad had died, you sounded like an undergrad begging his Psych 101 prof for extra credit. Then there was Jim Webb, the man who has overnight spawned a million Tweets. Webb was angry. Webb whined about not getting called on. Webb didn’t seem to remember his kids’ names. Webb dragged his wife into this, twice, the only family member pictured out the audience unless someone was related to the Santa Claus guy. But Webb saved the best for last, playing out his PTSD live on stage, grinning manically while explaining how he killed a man in Vietnam. Get some help, Jim, we’re worried about you, man. And no props to CNN. A full thirty minutes of trash and commercials before the debate proper started? Why not bring out some Vegas showgirls? Letting Obama do a full-on promo piece saying “Vote Democrat?” Having their Official Black Guy Reporter Don Lemon ask one and only one question about #BlackLivesMatter? Then having the Official Hispanic guy (“Gracious, Anderson”) do the questions about weed and illegal immigration? And no questions at all about Israel, the Palestinians, the current war in Iraq, Afghanistan, or Planned Parenthood? The only question left: what was Joe Biden, watching this all at home, thinking? Yeah, well one thing is blindingly clear about this schmuck. He’s the poster child for “if their lips are moving…”. Not that all politicians are liars to one degree or another, but this one was so blatant I had to laugh. I didn’t watch the so called “debate”. I don’t give a damn anymore. Murica will get whatever it deserves. I would vote for Bernie, but I’m never voting again. It doesn’t make a damn bit of difference who wins..they’re all owned, lock, stock and barrel. Well. the Kill’ certainly appeared precedential in her abbreviated Burqa! But it must be excruciatingly revolting under there for her DEM stocking horse, BadAss (And I do mean Aϟϟ) Bernie! It might be that the four guys up there with Hillary are ringers mustered only to make her look OK. That seems to be their designated party loyalist role. Webb told us that he promoted the “pivot to Asia” two years before Obama moved that way. That alone is enough to kill any interest I had in him, given his once-upon-a-time concern about the judicial/prisons nightmare, etc. Bye-Bye. I saw the thing at a debate watching party for Sanders people, so I’m biased, but I really am trying to get a sense of how other people viewed his performance. Do you truly think he did that badly? I was, again, impressed by his candor and lucidity. Also, getting known is still a central task for him. By that standard, I thought Sanders did very well. As a federal Public SERVANT, I can attest HillarE-mail BROKE FEDERAL LAW. And Bernie is now her DEM Enabling Accomplice, after-the-fact!